The picture above is of the park from the point of view of the neighbors. 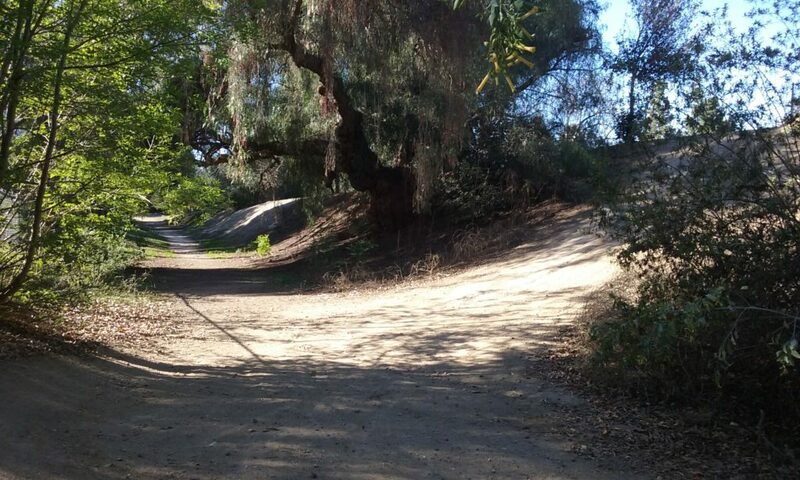 The picture on the right is what San Juan Park looks like from the trail it is next to. 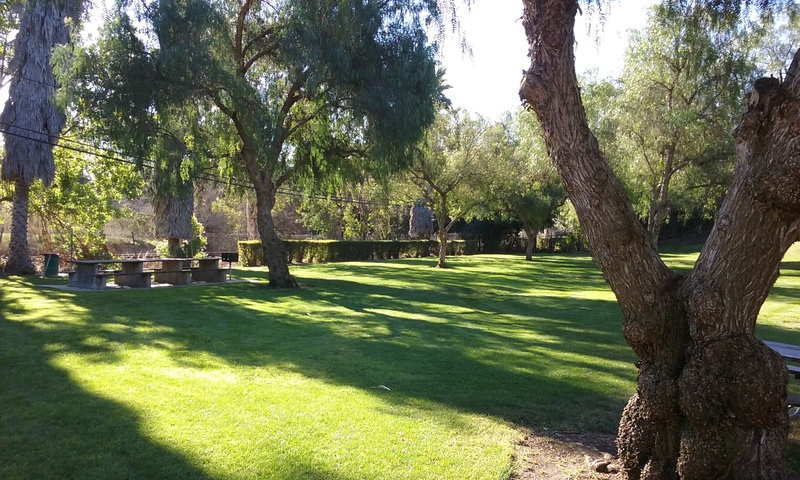 The park is primarily to serve the neighbors in the form of just looking nice and perhaps flipping the Frisbee. There is a picnic table and next to it a BBQ which only needs charcoal and lighter fluid. The restroom was closed because of a homeless problem. The neighbors say that calling the Parks Department the restroom can be opened for parties there. The park can also serve the inhabitants of the whole city in that it can be a staging area for at least four interesting walks as described below. The park looks new because the grass has been recently replanted but the towering eucalyptus trees reveals its 60 year heritage. To get to San Juan Park, take Harbor (3/4 mi) north of Bastanchury to La Entrada (right). Right on San Juan Drive to the end. It is easy to find the openings in the fence to the trail which you can take either north or south. The openings are tight but available on each corner of the back fence of the park. This is the start of the loop going north making it the counterclockwise loop. 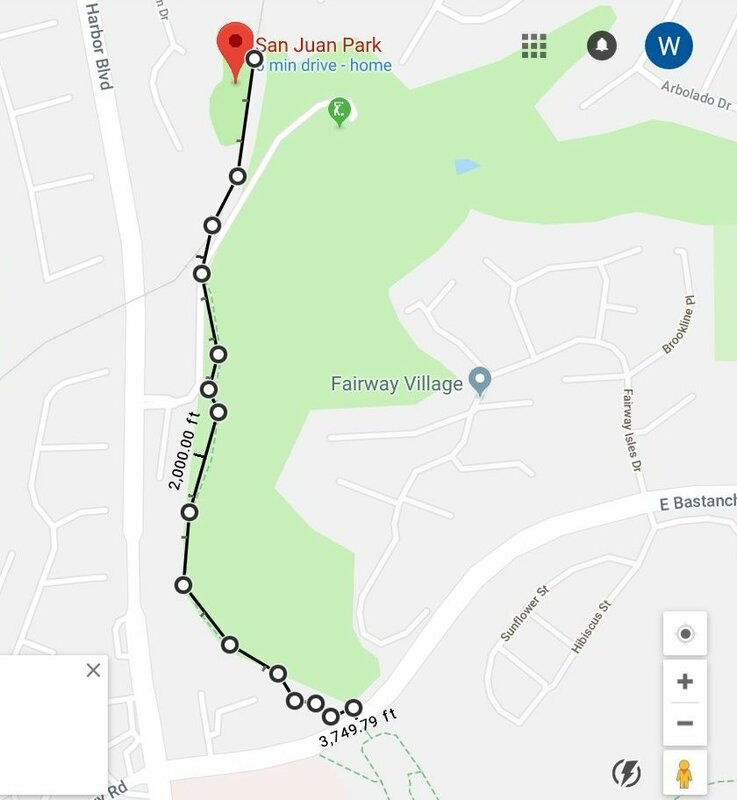 San Juan Park Loop (1.9 mi). 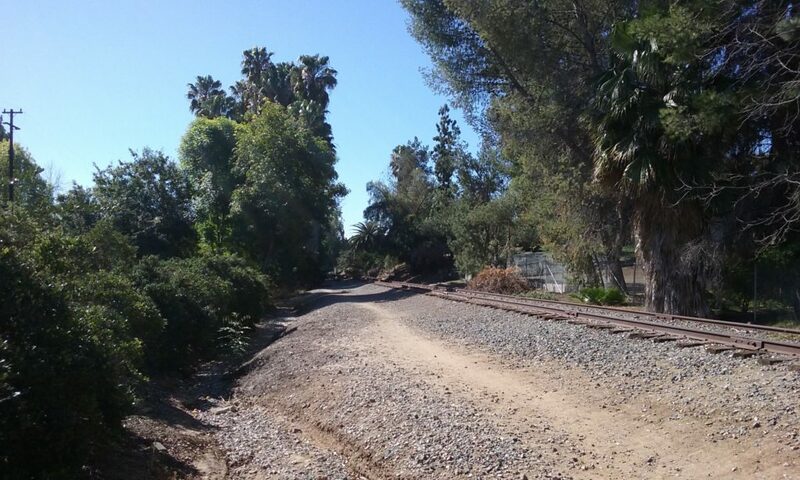 Perhaps this loop should be called “railroad loop” since it almost entirely on abandoned tracks. To walk the loop starting north you will be immediately impressed by the tall trees and dense vegetation that the neighbors are also able to enjoy. (So dense you can’t see the neighbors from the trail.) It is very lush even in the summer. (Morning hikes are better if you want to be in the shade of those trees.) 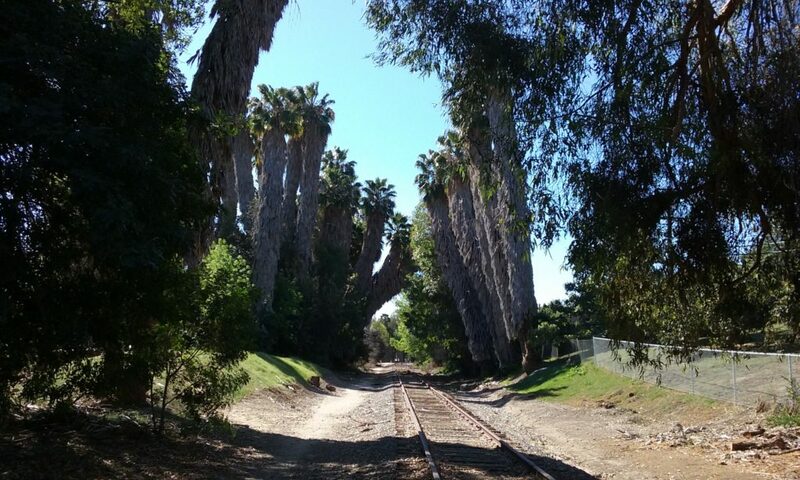 Those trees surround an unnamed creek that parallels the tracks. There’s virtually no slope there, so there’s a lot of standing water from yard runoff. 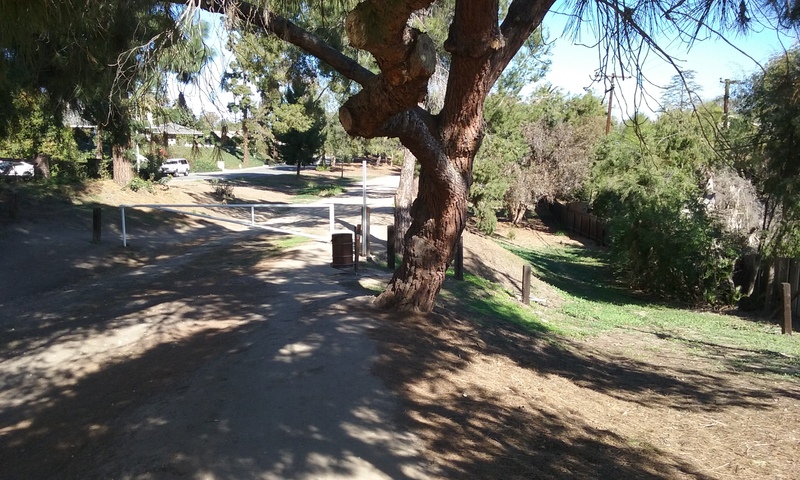 Assuming you left San Juan Park going north, about a third of a mile along, you will come to Hermosa Drive where you will turn left and walk on the street. 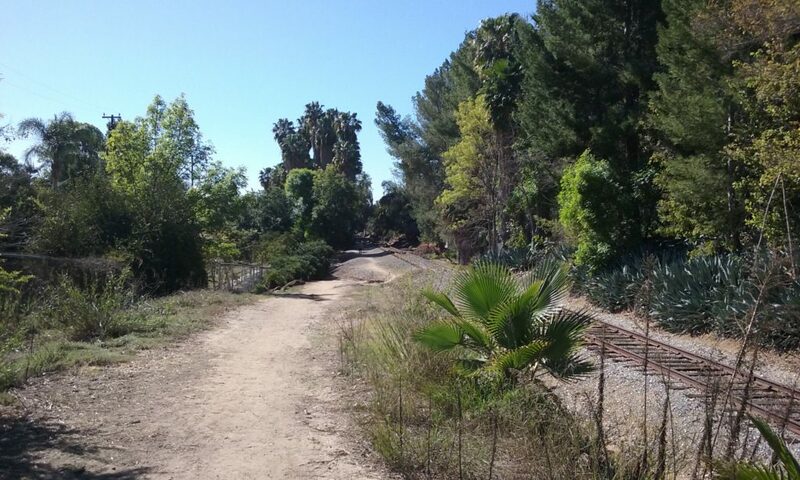 (If you instead continued along the tracks beyond Hermosa the trail becomes narrow, rocky and very littered.) Walking on Hermosa (west), you will find the street to be free of traffic which makes the off-trail part of the walk, not so bad. After several blocks you will cross Harbor and then you will see Laguna Lake. But to make the loop don’t go the lake. 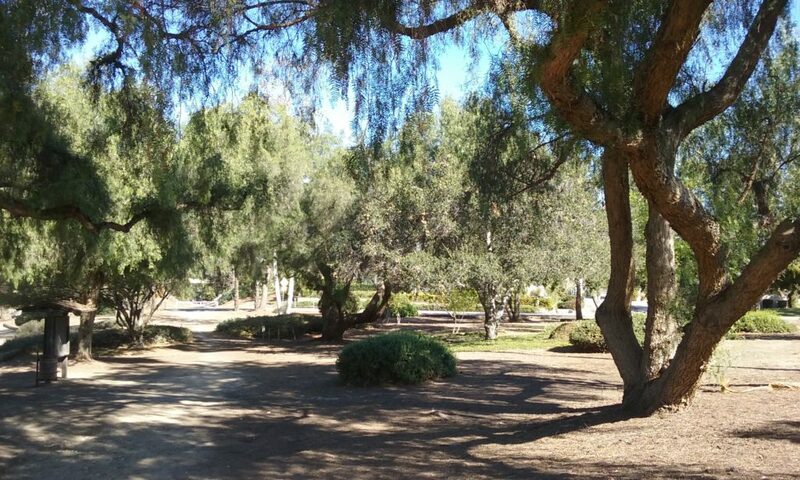 Instead enjoy the small shady park on this side of the lake called Cooke’s Corner. 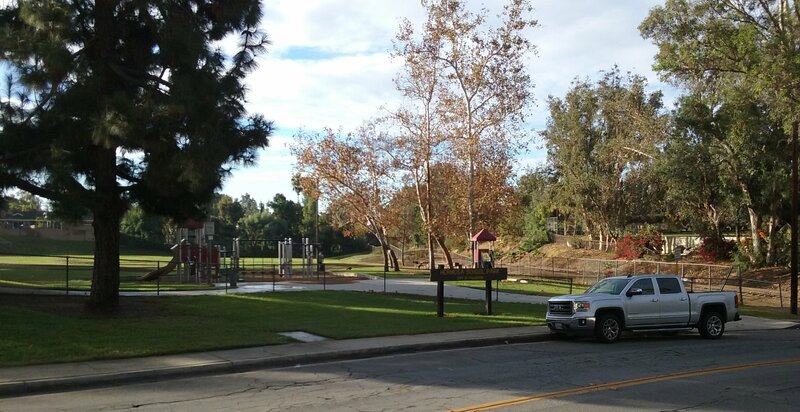 Through that small park is the most famous trail in Fullerton; the Juanita Cooke Greenbelt Trail. On your way back going south, the Juanita Cooke bridge goes over the track you want to be on. Don’t take the trail to the right here. It goes to a street and NOT the tracks below. Go over the bridge (far left above) and another 100 yards to a trail that goes down. You are going to follow the Juanita Cooke Trail south. 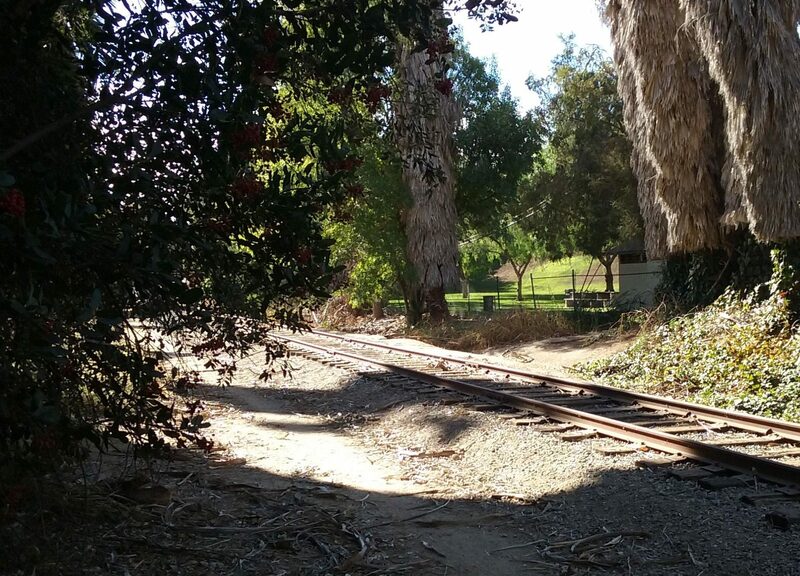 It is a dead straight path because it was once railroad tracks. (This was from 1918 to the late 1950s. The rails, the ties and the rock were removed in the 1960s which makes this part of the walk most comfortable.) You can’t miss where one train track crossed over the other. 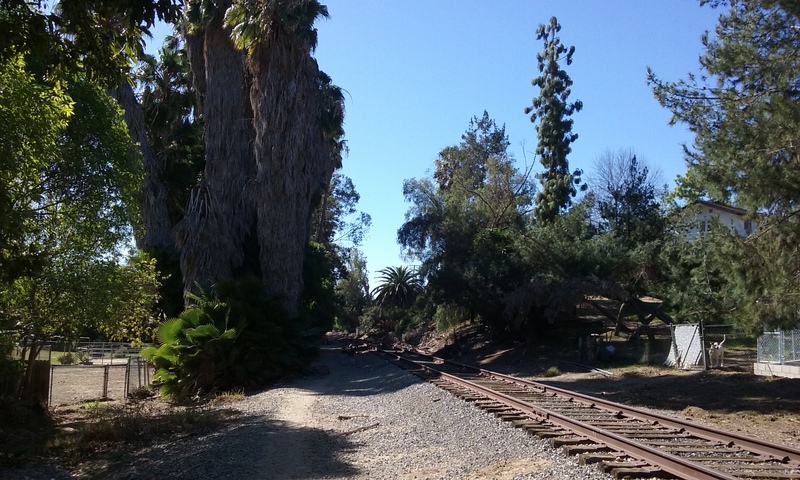 The lower track is the one you started on and need to get back onto. (The path down, is on the south end of the bridge.) When you are down there walk back (north) and in only .4 miles you will be back where you started. Looking north east at Harbor Blvd. 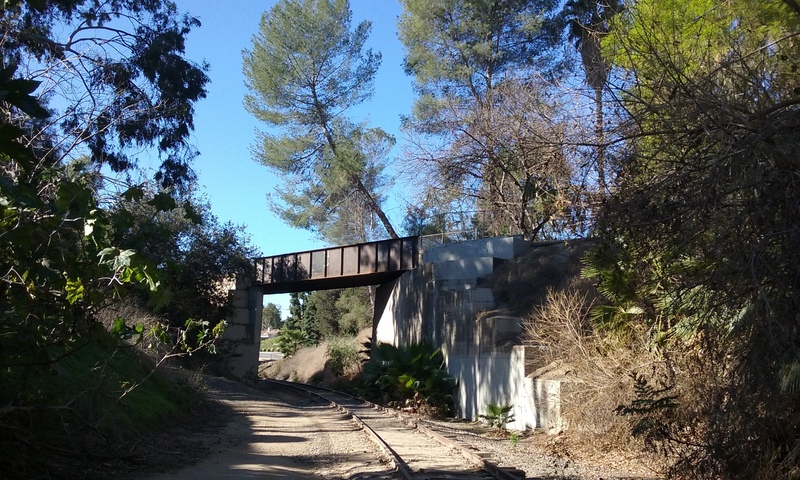 The Pacific Electric bridge is behind the camera about 100 yards. On your way back, yes that’s Harbor you will be walking under. Then you will pass a small portion of the Fullerton Golf Course. Continue north following the tracks. 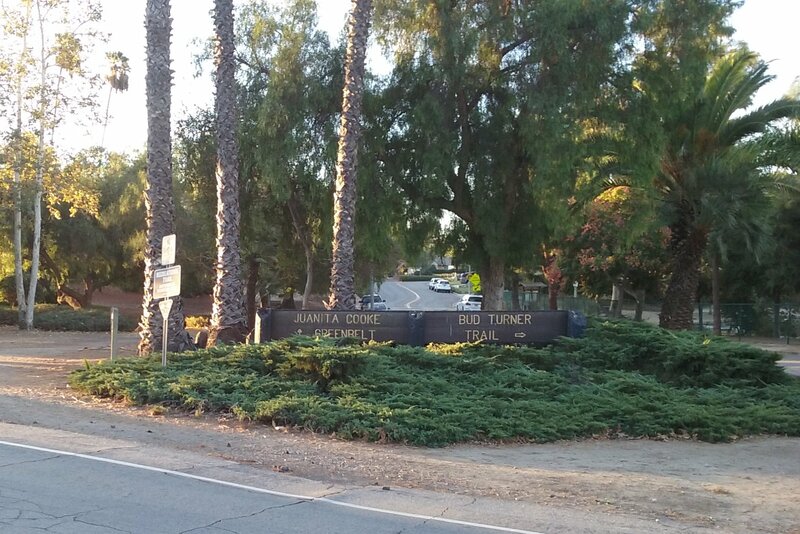 You will see San Juan Park on your left in about a hundred yards. Notice before leaving closest contact to the golf course that a trail goes up hill behind you. If you were to follow it, you will be on the west end of a small dam. It’s not really a dam, its a dike. The difference is that the water on one side of a dam is useful because its flow is controlled. A dike blocks water. But this dike, actually a satellite dike, is unique in that there are one way valves on it. For more on this structure go to this webpage: Dams and Spillways of Fullerton. 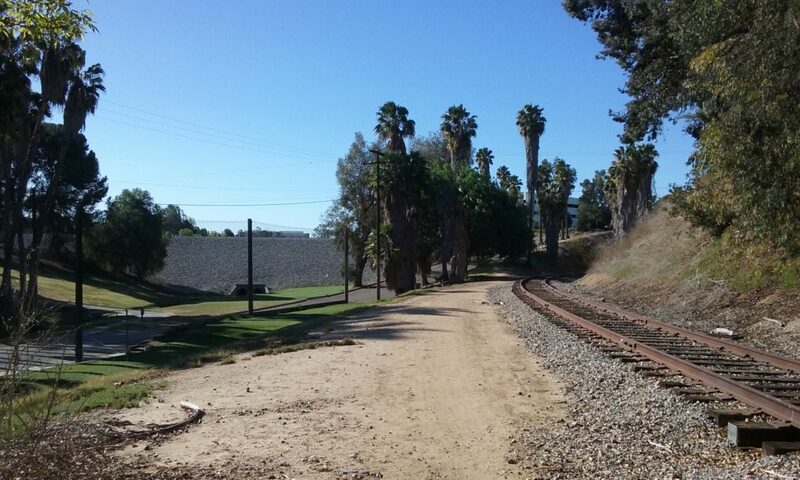 The trail that goes south past the dike, goes more than a mile further to the biggest dam in Fullerton; the Brea Dam. 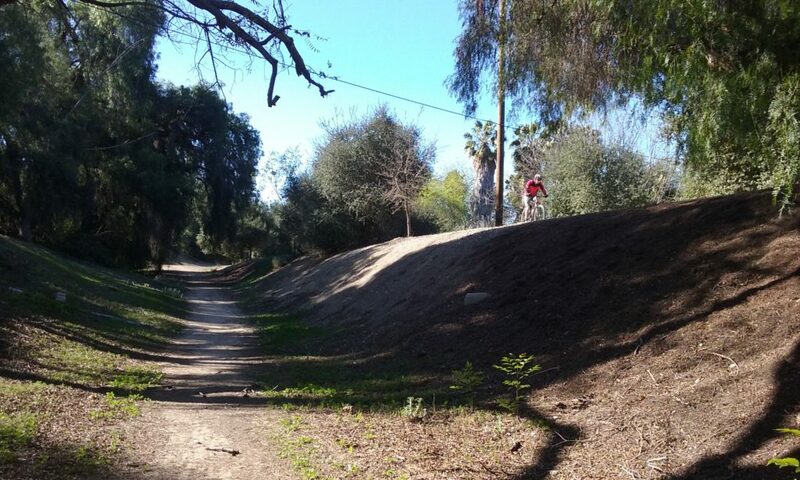 The dam and the trails associated with it are described in Brea Dam Recreation Area. When you were at Cooke’s corner, next to the lake, you were halfway done. If you gave into the temptation to go around the lake while you were there, you will have added 3/4 mile (20 minutes) to the total path. This is what you would see in the first few steps on the trail to the right. See the gallery below for a sample of the views you will see in this clockwise loop. Same (1.9 mi loop) but Starting South from San Juan Park Taking a loop in the other direction is to view the same scenery but obviously in a different aspect. 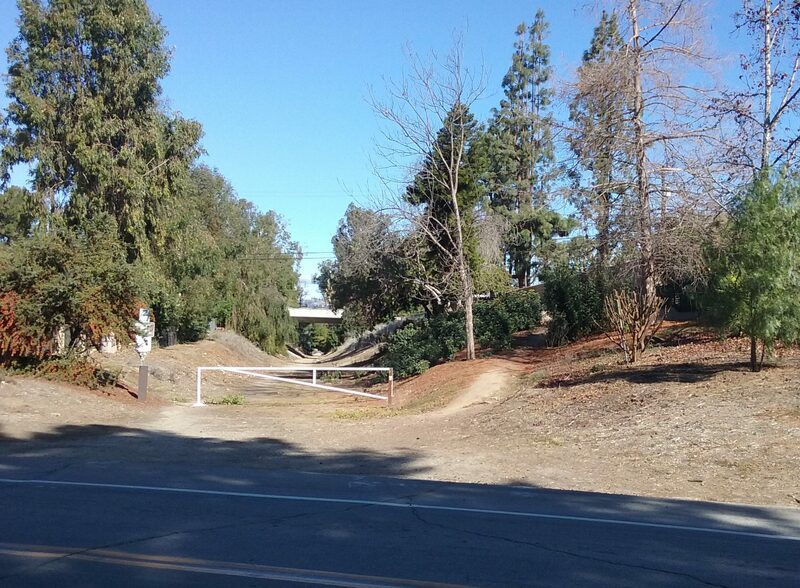 So it is like two different trails. To leave the park and begin the loop going south, you will shortly see Harbor Blvd going over a bridge which you will of course, walk under. (Before you get to the bridge, even before you see the bridge you will have passed the trail to the left which takes you past the dike mentioned above.) About 700 feet beyond the bridge that supports Harbor is another bridge; an old railroad bridge that now supports the Juanita Cooke Trail. You will see the ramp up to the Juanita Cooke off to the left. Once on the upper trail, go over the bridge north. It is a dead straight path north with green on either side and below you. Yes you are on an elevated abandoned rail line. 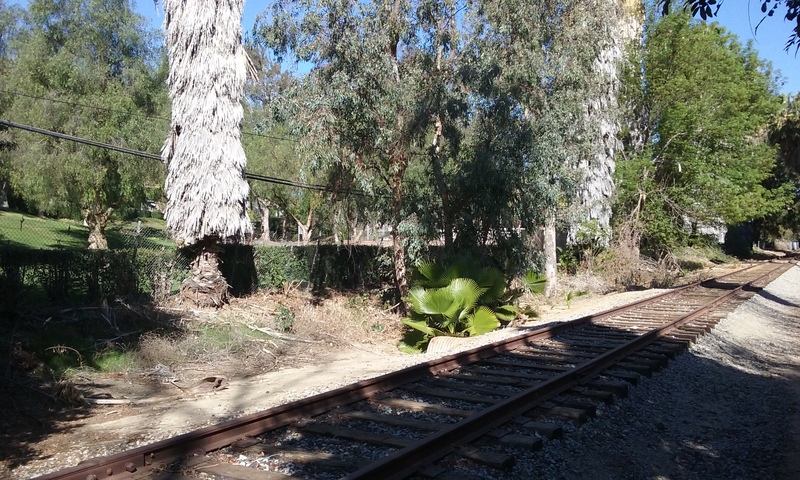 It is something of a coincidence but Juanita Cooke (the old Pacific Electric) is elevated most o the way, while the Union Pacific trail is below street level most of the way. You will come to Laguna Lake in about .6 miles. There’s a nice park bench within sight of Laguna Lake. That’s Cooke’s Corner. You are halfway through the 1.9 mile loop. (Walking around the lake will make the walk total about 2.5 miles.) 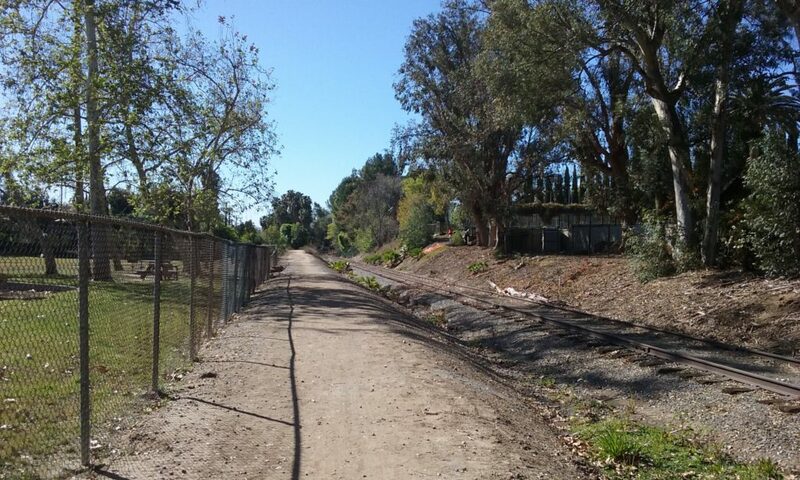 Get off the trail and walk east along Hermosa Drive ½ mile. 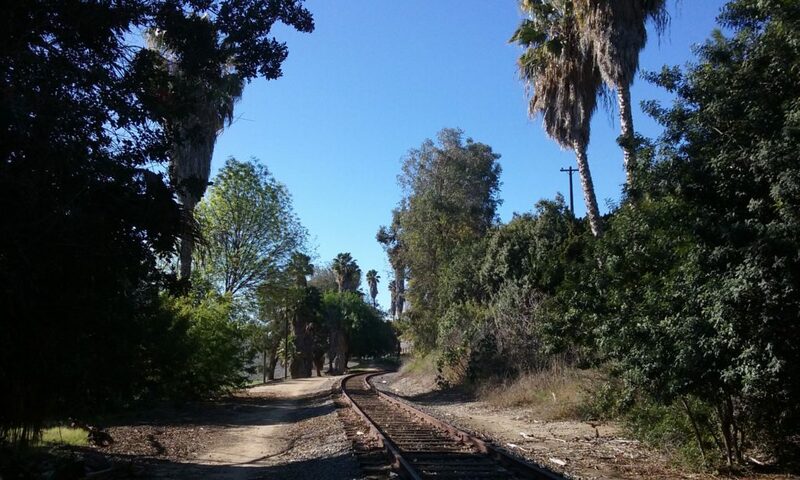 You can’t miss the tracks and trail that will take you back to San Juan Park. The walk back to where you parked at San Juan Park is the most spectacular if you like trees. Just where the trees are the highest and the temptation is to walk on, look to your right for the opening to San Juan Park where you are parked. 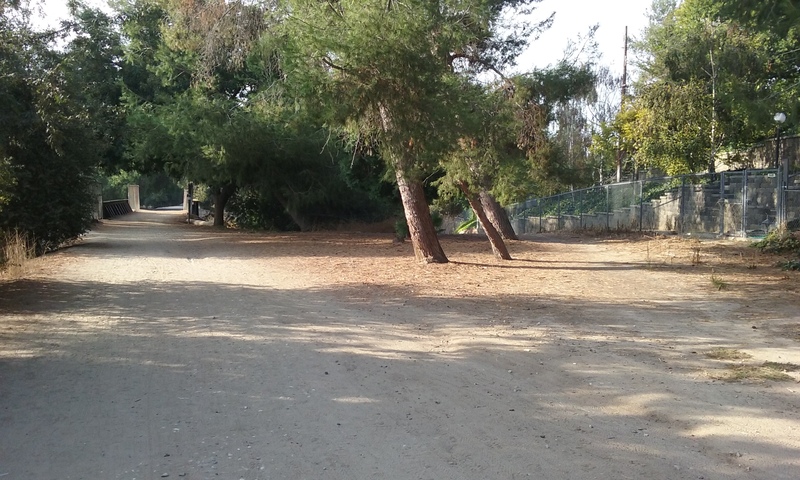 Hermosa Park with the trail you were on in the back ground. The trail gets rougher continuing to the right but goes to imperial and beyond. 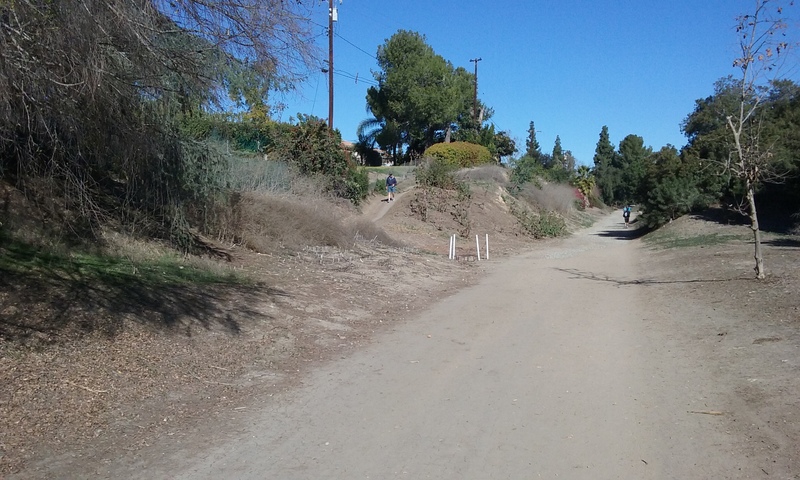 The trail that leaves San Juan Park (to the left) that is, going north goes straight as an arrow on past Hermosa Drive, past Las Palmas, past Imperial. It passes Lambert and only then starts curving. It curves around Home Depot heading west to Los Angeles. The trail beyond Hermosa, however, is very uneven with lots of junk and uncomfortable rocks to constantly watch for. (This distracts from appreciating the scenery.) A good place to stop is Imperial where there’s lots of parking and a doughnut shop. Out-and-back (to Imperial) is 1.7 miles. The trail that leaves San Juan Park going south toward the dike is not quite as green, but more interesting. 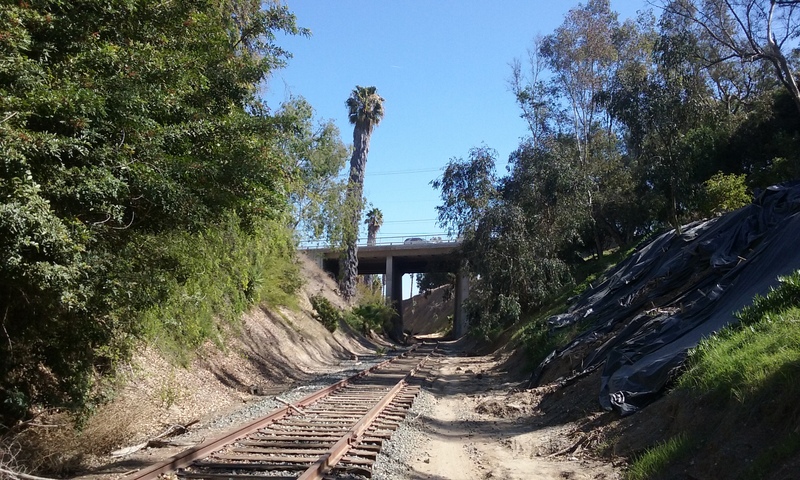 In starting this way for the loop you would go to the right under Harbor Blvd. But for the out-and-back walk, take the trail up and to the left. You are climbing to the top of dike. As a side trip you can walk the ridge of the dike and wander around the Fullerton Golf Course club house. There’s benches to watch golfers at the driving range. (You can also sign up to walk the course. They want you to pay $20 but if you have an old putter, who’s gunna know. It is two miles in length and all sidewalk, if you are into that sort of thing.) The dirt trail next to the fairway is free. It is very interesting walk with the fairway on one side of you and a steep hill on the other side of you. A good place to turn around (1.4 mi round trip) is the tunnels that go under Bastanchury Road. You can go through either tunnel into the Brea flood control area. 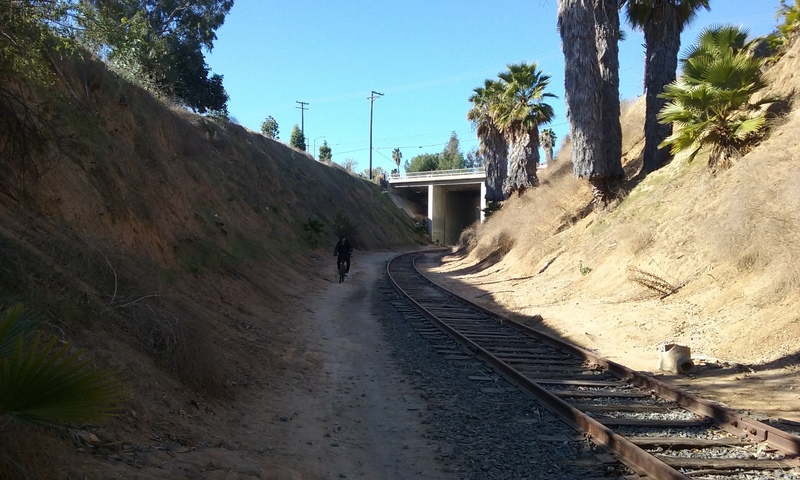 The two tunnels lead to different trails which parallel the Brea Creek. If you walk clear to the Brea Dam the round trip distance is 2.6 miles. (East tunnel has the better trails.) See the web page Brea Dam Recreational Area for more information about the trails on that side of Bastanchury. Take the trail on the right to the bridge. That’s Las Palmas. The Bastanchury Home is .6 of a mile to the right. 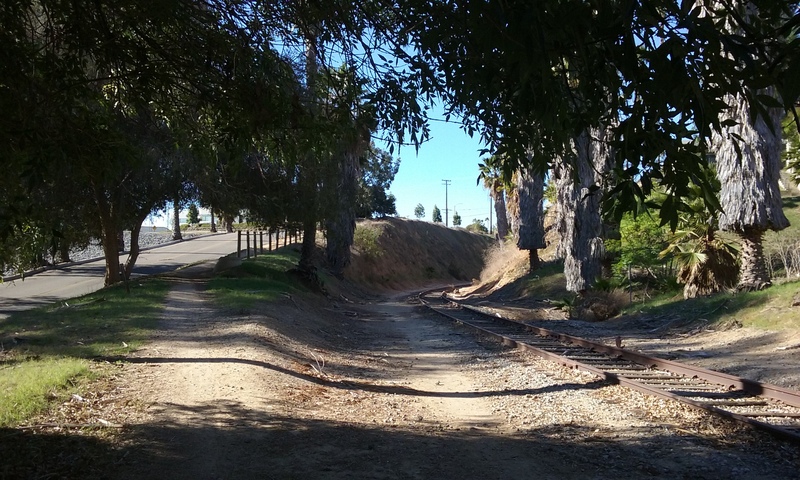 By extending the 1.9 mile loops (starting in either direction from San Juan Park) you can see a bit of history by adding a half a mile on sidewalk. In either direction you will go through Cooke’s Corner. To see the Bastanchury Home, pass through Cooke’s Corner heading north for only a block or so. 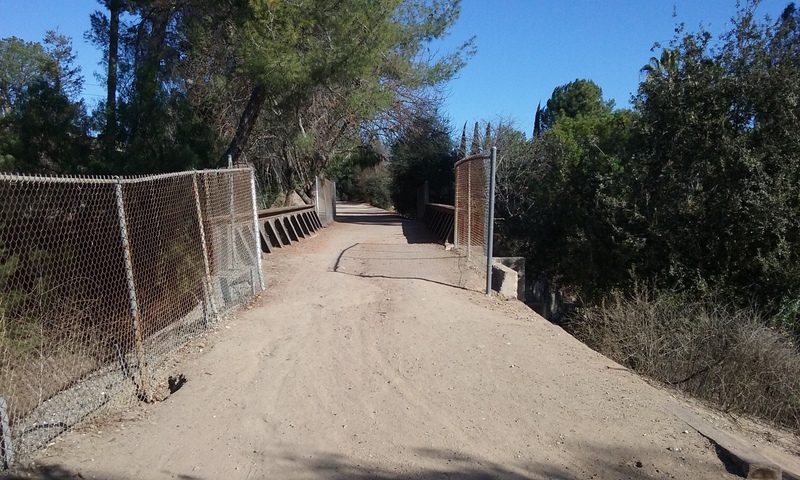 The picture to the left shows a bridge in the background and a trail that goes up and to the right. 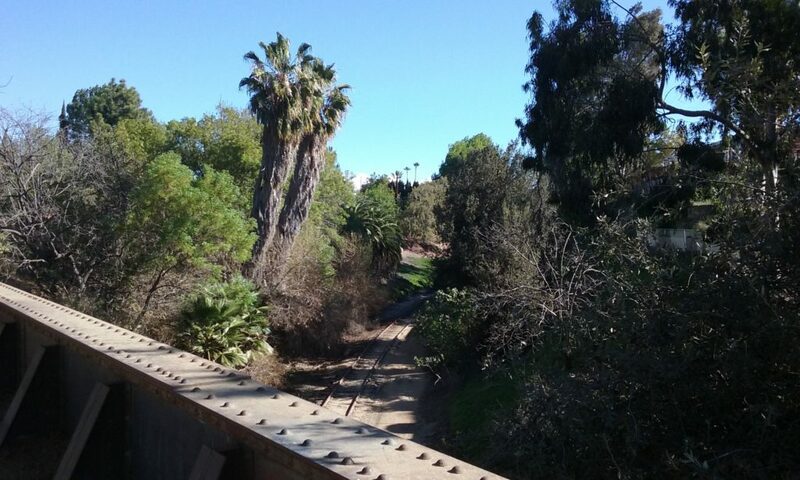 The bridge is Las Palmas and the trail takes you there. Walk to the right (east) on the Las Palmas for .6 mile. The home is on the north-east corner of Las Palmas and Tunalis Drive. For more on this bit of history click here–> Bastanchury House. The house looks old but not really much bigger than any of the other houses in that neighborhood. This is odd in that Bastanchury at one time was the largest orchard in the world and owned most of the land in Fullerton, Placentia and Brea. This is often the history of very old money; it kind of disappears. 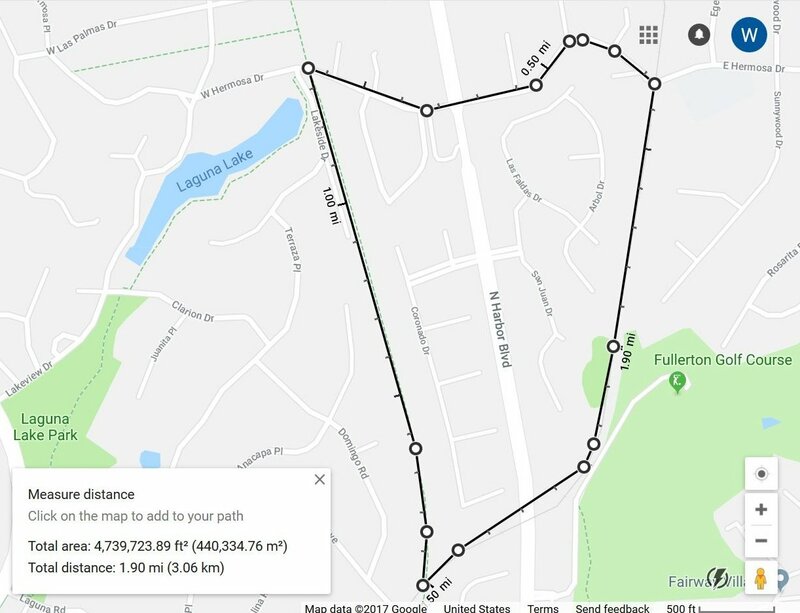 You can of course retrace your steps to make it an out-and-back or to make it a for-real loop by continuing past the Bastanchury House to Sunny Wood Drive. Go south to Hermosa Drive. 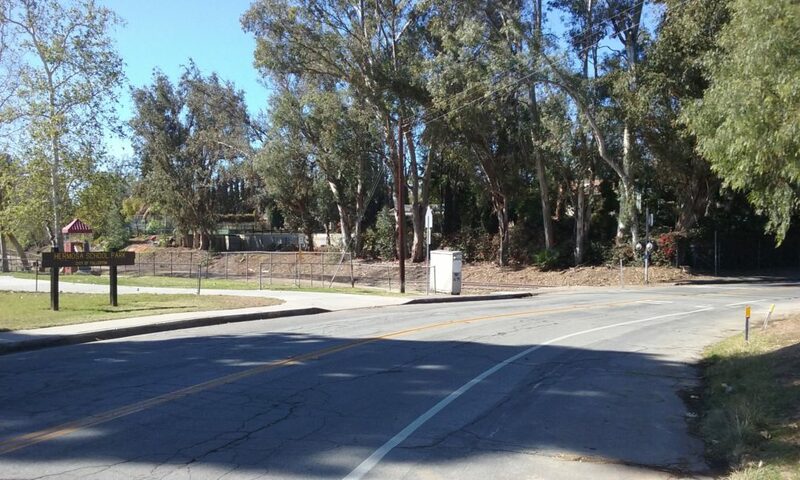 You can see the school from there and the trail to San Juan Park is on its west side. If the restroom is still working at San Juan Park, perhaps you can put up a sign that says call this number to reserve the park and have the restrooms open. Even if no one does, having the sign there removes the stigma of Parks and Recreation being so dumb as to have a restroom and then close it. Cooke’s Corner is well maintained, shady and beautiful. It is the intersection of four trails and works well as a starting point for adventures on these trails. It would be appropriate to have several more benches perhaps two of which are close enough so people can talk to each other. There is plenty of parking along side the park but it isn’t clear that it is available on its north side. There’s some ambiguous posts that should be removed. This would make it consistent with the reality that all roads that go by parks are OK for parking.